The 4-star Aqua-Spa **** Conference and Wellness Hotel is situated in Cserkeszolo, in the best known village of the area Tiszazug, only 30 km far from Kecskemet city. Due to its perfect location the hotel can be easily reached from the M5 motorway. The Medical and Thermal Bath and the Aqua-Lux *** Wellness Hotel are located only 200m from Aqua-Spa Wellness Hotel. 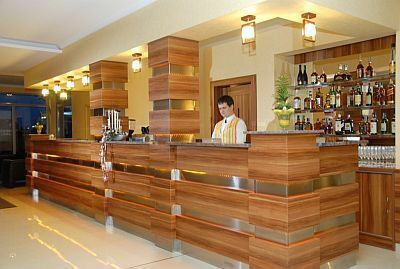 The hotel, opened in February 2008 in Cserkeszolo, offers 17 double rooms with 2 superior category rooms among them, 16 bungalows and 10 luxury apartments. Thanks to its medicinal water, Cserkeszolo offers not only a perfect place for relaxation and regeneration but also offers sporting activities and medical treatments. Hotel Aqua-Spa**** Cserkeszolo ensures airport transfer for a fee. Aqua-Spa **** Wellness and Conference Hotel awaits its guests with air-conditioned, non-smoking rooms equipped with modern technology and own balcony. There are 15 standard double rooms (extra bed is possible) and 2 superior double rooms with larger floorspace, own jacuzzi bath and living room corner. LCD-TV set (satellite), minibar, telephone, Internet-connection, built-in safe and magnetic card lock. The superior category rooms have got larger floorspace, own jacuzzi bath, bathroom with hairdryer and a living room corner furnished with leather furniture. The Hotel recommends special accommodation solution for families, the Bungalows and the non-smoking luxurious Apartments can accommodate 4+2 persons. Pets are not allowed in the area of the hotel and the Apartments. For our guests arriving with pets we offer only the Bungalows. The restaurant of the Aqua-Spa Wellness and Conference Hotel - offering traditional Hungarian foods and the specialities of the international cuisine as well - awaits the clients who prefer culinary delectation. The perfect relaxation of the guests is ensured by the winter garden connected to the restaurant of the hotel. Internationally acknowledged wine selection and fine cocktails await the guests in the drink bar and in the pool bar connected to the outside swimming pool. In the wellness area of Aqua-Spa**** Wellness and Conference Hotel Cserkeszolo experience pool, outdoor and indoor pools, pool for children and saunas (Finnish sauna, infra sauna, bio sauna, steam bath and sink-in pool) are available. Cosmetic saloon, pedicure, manicure and a wide range of massages welcome our guests and those who want to relax and to refresh themselves. The 82 C geothermal water coming from a depth of 2300 meters - thanks to its iodine, alkali chloride and hydrogen carbonate content - is exceedingly appropriate for the treatment of locomotor and rheumatic diseases as well as gynaecological inflammations. The water is succesfully used for cures regarding cutaneous diseases. For the asthmatic problems we offer the Bochnia saltcave. As a drinking cure the medical water gives help for acute and chronic stomach, bile disorders and bronchitis. The Thermal Bath, thanks to its well equipped therapeutic centre, offers excellent possibility for guests seeking meditation and for those who would like to enjoy all the comforts. For those guests who prefer bathing, wavepool, swimming pool, pool for children, attraction pools, back massager and Europe's first and longest 2-lane tarpaulin slide and 'water castle' are available. The hotel offers a wide selection of programme opportunities and leisure activities. The staff of Hotel Aqua-Spa helps you to organise your leisure programmes: bowling, billiard, night bathing, quad tours await the guests preferring extreme experiences. Tiszakurt Arboretum is an ideal location for individual family activities but cycling, archery, paintball and beach volleyball are also available. On demand we organise water trips on the river Holt-Koros in Szarvas. We await our guests with additional services: grill garden, closed parking lot, beach volleyball, playground, airport transfer. The 270 sqm large conference center of the 4-star Hotel Aqua-Spa, built on the top floor of the building, offers air conditioned, natural-lighted rooms for up to 220 persons. The conference room can be sectioned in 3 smaller rooms (60, 80, 130 sqm), the complex with the meeting-hall, with its own drink-bar and the 48 sqm large meeting room ensures an excellent place for conferences, company events, trainings and weddings. The conference rooms of the Wellness and Conference Aqua Spa Hotel Cserkeszőlő **** - thanks to its up-to-date equipment - ensures excellent venue for any kind of events. In high season the min. length of staying is 3 nights. The room prices include the buffet breakfast, the use of the wellness services (saunas, sink-in pool, pool for children, outdoor and indoor pools, experience pool), closed parking lot and VAT.